When the music stops, the mystery begins. For many reasons, one may assume that I saw Give My Regards to Broad Street years ago. I’ve been a Paul McCartney fan for about 30 years, and I snagged a copy of the movie’s soundtrack when it hit the streets in the fall of 1984. However, I never bothered to see the flick itself. How come? Two words: vicious reviews. No one liked Regards, and it inspired some genuinely brutal comments from critics. Heck, even McCartney fans failed to defend Regards, and it sank like a stone. With this DVD release, I figured it was about time to give Regards a look. The film presents an incredibly minimal plot. Paul completes a new album and entrusts an ex-con named Harry (Ian Hastings) with the master tapes. He goes missing, as do the recordings. This sets off a chain reaction of dismay, especially since Paul will apparently lose his production company if the tapes don’t turn up by the end of the day. He had a minor cash flow problem earlier, for which his manager Steve (Bryan Brown) arranged a loan. If the tapes don’t appear in time, nasty William Rath (John Bennett) and his Rathbone Industries will take over Paul’s company. We follow Paul and his crew through the day. He goes through rehearsals as Paul and the authorities pursue the tapes. In a minor subplot, Ringo Starr meets a journalist (real-life wife Barbara Bach) as she prepares an article about the album. Ringo becomes smitten with her and tries to hook up with her. For all intents and purposes, Regards offers little more than a long music video connected loosely by that basic plot. We find many musical set pieces, and elements related to the tapes appear in between them. It probably should seem like the other way around, as normally the story would take priority over the musical bits. But that doesn’t happen here, as the story seems totally secondary to the set pieces. To say the least, this leaves Regards as a mess. It offers neither a good story nor intriguing musical snippets. The latter offer a few decent segments, though. 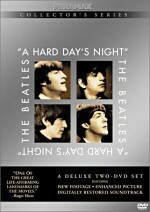 The best part of the movie shows a three-song rehearsal segment in which Paul, Ringo and the band tear through “Not Such a Bad Boy”, “So Bad” and “No Values”. Those are three underappreciated songs, and they enjoy the most straightforward performances in the film. We just watch the band play, and that’s a lot of fun. It’s similarly a treat just to see Paul and Ringo interact. Paul also does versions of a few tracks in the studio with additional accompaniment, and those are watchable but not terribly fascinating. Probably the movie’s funniest bit comes from a fantasy sequence in which Paul envisions his fate after his musical empire collapses. We see Paul busking outside a tube station as he plays a cheery version of “Yesterday”. Otherwise, Regards has no redeeming value. Many of the musical numbers simply seem ludicrous. We get a quasi-West Side Story take on “Ballroom Dancing” and some sort of bizarre futuristic mannequins of “Silly Love Songs” complete with a terrible “robot dancer”. The latter performance may be the most jaw-droppingly atrocious thing I’ve ever seen; one can’t help but shout, “What were they thinking?” The Bronte-style fantasy connected to “Eleanor Rigby” is almost as bad. The story elements seem less insane but remain bland. Loosely based on Paul’s own experiences while he recorded Band on the Run, the plot simply lacks much coherence or sensibility. I never actually understood why Harry had the tapes, and the movie seems so disinterested in the story that it all falls terribly flat. It doesn’t help that Paul presents an unconvincing performance as himself. Like I noted earlier, I’ve been virtually a lifelong fan of the man. He remains my favorite Beatle and I’ll always be in the tank for him. Unfortunately, he displays absolutely no personality or spark in this film. Not that a solid performance would have rescued this catastrophe. 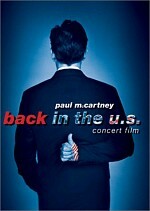 Beatle fans will find some moments to enjoy because of the musical performances. Even those of us who adore the Fabs and Macca will find it tough to sit through this dreck, however. 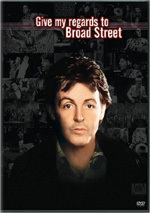 Give My Regards to Broad Street appears in both an aspect ratio of approximately 1.85:1 and in a fullscreen version on this double-sided, single-layered DVD; the widescreen image has been enhanced for 16X9 televisions. Only the letterboxed picture was reviewed for this article. While it looked better than I expected, Regards presented a generally mediocre image. Sharpness mostly appeared adequate. At times the picture seemed somewhat soft and ill-defined, and more than a few fuzzy sequences appeared. Still, some of that appeared to stem from the original photography, and most of the movie displayed reasonably positive clarity and delineation. I noticed no issues with jagged edges or shimmering, though a little light edge enhancement seemed apparent at times. Surprisingly, print flaws barely made an impact. The occasional speck or spot popped up, but the movie mainly seemed quite clean. Colors varied dependent on the setting. Given that most of the movie took place during a dreary London day, not a lot of vivid hues appeared. The most colorful sequences came from the production numbers. “Ballroom Dancing” demonstrated nicely bright and dynamic hues, but the colored lighting of “Silly Love Songs” was a bit heavy and murky. Mostly the tones looked acceptably concise, though. Blacks also were a little inky but generally clear, and low-light shots demonstrated adequate definition without too much opacity, though they occasionally seemed a bit flat. Overall, Regards was watchable and fairly attractive, but it remained pretty average. The Dolby Surround 2.0 soundtrack of Give My Regards to Broad Street fared better but not by a ton. Not surprisingly, the soundfield demonstrated limited ambition. Music dominated and offered the mix’s most dynamic elements. The songs showed quite good stereo delineation, especially during sparer songs like “No Values”. The instruments were spread neatly across the front and all given good localization. Effects tended toward general ambience, and they seemed reasonably natural. The surrounds remained passive most of the time. Really, they rarely did anything other than mildly reinforce the front. The “Eleanor Rigby” fantasy boasted more active music from the rears, and a thunderstorm also kicked some life from the back. Otherwise, the surrounds stayed generally quiet. Audio quality was fine for a movie of this era. Speech seemed a little thick at times, but the lines remained intelligible and usually appeared fairly concise. Effects played a small role and came across as acceptably accurate and clear. Music was the most important factor and usually fared reasonably well. The songs sometimes sounded somewhat dense and didn’t appear tremendously clean and natural, but they represented the original recordings decently. Highs generally sounded bright, and low-end was pretty warm and firm. Ultimately, not much happened via the film’s soundtrack, but it was good when I factored in its age and genre. Since Regards comes as a budget release, it doesn’t seem like a surprise that it includes almost no supplements. We find two trailers. We get a US clip and an international ad. After almost 20 years, I finally gave Give My Regards to Broad Street a look. I wish I’d left it on the shelf. Actually, as a huge McCartney fan, the movie offered enough cool musical moments to warrant my attention, but as a film, it stunk. The DVD provided decent picture and sound but lacked substantial supplements. McCartney obsessives will want to pick up this clunker, but others should stay far away from it.